Our family was in the car this week going to do an errand. I was asking the girls about their field trips for school. The wee-est one had gone to the zoo and was really looking forward to seeing the snowy owls. In fact, she was looking forward to seeing the snowy owls so much that she asked me to make a snowy owl for her to take to the zoo. So I did. 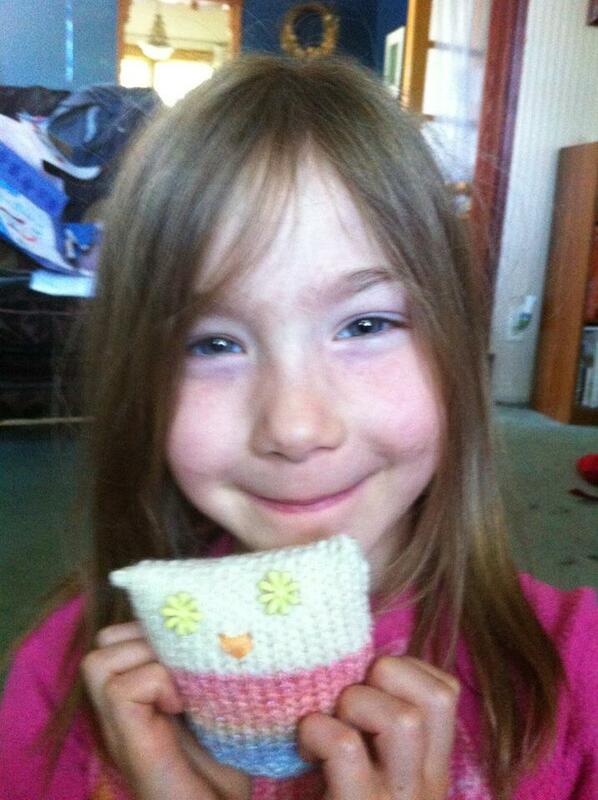 We scounged up some leftover yarn and made an owl in about 2 hours – which included finding the button eyes and the yarn. Oh dear… I think she’s just figured out how to do perfect delivery of a joke. I think I’m in trouble. Right out of the mouths of babes! Love it! I’m sad to say that the snowy owl at the Lake Superior Zoo didn’t make it through yesterday’s flood. We will not be telling the wee-est one this. Knitting Up North Blog at WordPress.com.